Is the month over already? These games I played first during September 2013. 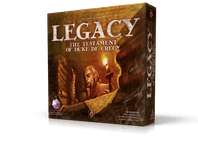 The first game in this list, Legacy: The Testament of Duke de Crecy was really good. The other games did not excite me too much. This game is really great fun! You may announce marriages and births of your children and later your grandchildren. You see your offspring marry great partners or sometimes some obscure ones. All of them bring you income and fame. And the fame, that is the game! Great components. This game by Stefan Feld has many ways to earn points and the theme is thin. Writing this down is like saying that water is wet. I like the clock cooperating with the six dice that will give you the action cubes. It demands a bit planning. At the beginning of each turn, in player order, a card has to be chosen. And because icons were minimally used this card selecting requires a bit too much time. And at the last couple of turns you might have so many cards that running your plans can be a bit too complex to run it smoothly. 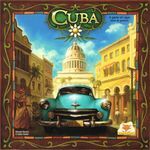 In the game of Cuba you produce goods at your lands, you trade the goods and construct buildings. I like the actions cards and it's planning element. The way you have to deal with your territory is also cool, if you build a building you have to build it over a production area. The game really looks fantastic! In Confucius you can influence your opponent players. If you give them a gift they have to support you when a student is to be promoted into a ministry. This element reminded me to MIL (1049), a game I now refuse to play. Confucius fortunately is better than Mil but not a game that blows you out of the water. I think the game material should have supported the game play better. They should have paid better attention to iconography. This felt a bit flat. You get goods, convert goods or ship goods while you are driving around the harbor. Quite a simple game and still we did not play it right until halfway the game. A game with a memory element. Unfortunately it is too chaotic to keep track on anything. So lay back and see the fun of persons misclaiming their roles. Having played it with four and five Mascarade did not leave a great impression with me. In this quiz game a subject is announced and then you gamble after how many clues, one, two or three, you know the answer. Next you may also bett if somebody else knows or does not know the answer. I am not too fond on playing knowledge games unless in teams. This has a nice little spin off though. All players represent a nation with a population what's size is only known to the player. The last remaining nation wins. Playing you launch missiles or send bombers wearing warheads to your enemies. Your opponents might play some defense but if a nuke drops on them you have to give an arrow on a clock a sling and that determines the effect of the bomb. This is not the greatest card game. Playing an evil scientist taking revenge on his childhood town. The goal is to build a monster using two helps. It sounds nice and then it is roll and move. Well, to be precise, roll and move three. The dice determines the possible steps for all the three figures you controll. The game not only takes way too long, it plays slow and you can be eliminated from the game. Terrible game.